Where is the Free WiFi? 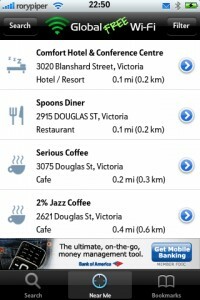 With all the issues with Rogers over the past week, I thought it might be worth mentioning an app that will help you find free WiFi near you. 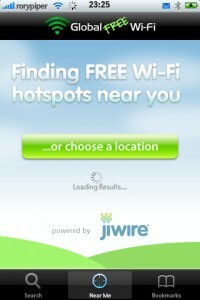 Take a look at “Free WiFi Finder“. This app is free, in the App Store. 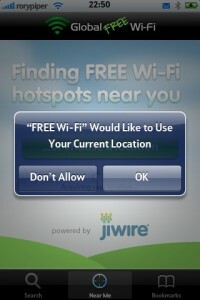 When you open it up, it automatically looks for your location, and displays free WiFi spots near you. You can also, search for specific locations, in many countries and cities, around the world. Great for traveling, something a lot of you might be doing this time of year. 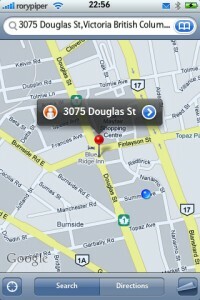 Once you find a spot you like, tap on it, and then tap on the address to open the location in the native Maps app. 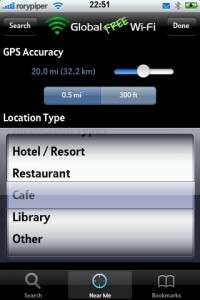 “Free WiFi Finder” has gotten mixed reviews, in iTunes, but it worked great for me. One obvious, major flaw in these type of applications, is that you have to be online for them to work. Which means, your 3G is working fine, or you’re already on WiFi. 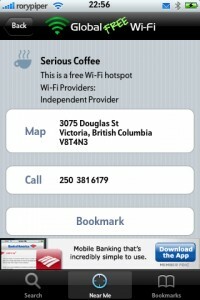 Well, with this app, you can set bookmarks for your favourite WiFi spots, and they are saved locally, on your iPhone. It will show you the address, but, obviously, you wouldn’t be able to use the Maps app, if you’ve lost your 3G, and you’re desperately looking for an internet connection. Thanks for reading this week. Please check out Green Candy for more iPhone news, tips, and tricks. I’m also on Twitter: @rorypiper.